The thought of Disneyland makes my heart go pitter-pat. I love it. And I love any opportunity to go to it. As an annual passholder and Southern California resident, I get to do it a lot, which pleases me to no end. It doesn’t have to be about the rides. Just strolling around, people-watching, and doing dinner is often enough. And if I get to do it with friends, even better. 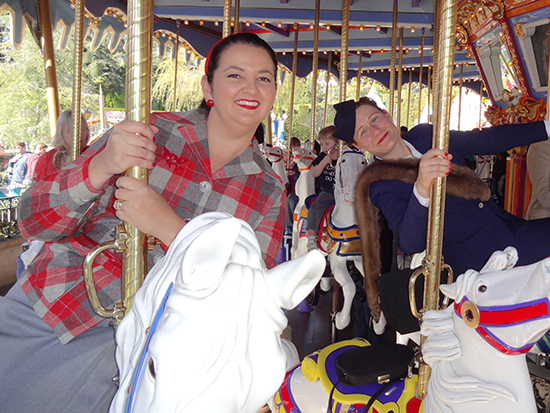 Last Saturday was Dapper Day at Disneyland and while walking around Disney in vintage isn’t new to me, it is a treat for some of my non-vintage friends. Actually you don’t need to wear vintage to go to Dapper Day. You just need to dress spiffy, which for many just happens to be vintage. And if I, as well as the others who went, can go out looking presentable and encourage all of those people who went out in public in pants half way down their butts, with bra straps showing and shorts cut to there, then I see myself as doing a service to everyone who is tired of sad-looking clothes. Vintage may be a passing fad for many who went – an opportunity to do what everyone else happened to be doing that day, a way to be noticed, but I don’t mind. I was there to be with my friends and we had a grand time. 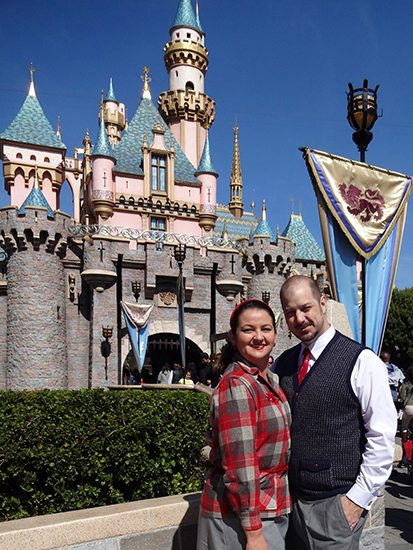 While I’m normally a 30s gal, I decided to channel a 1950s Pendleton ad, in honor of Disneyland, which was built in 1955. My red plaid jacket, belted, with a grey skirt and lovely low-heeled red wedges were perfect for walking around. Hubby Dearest and I in front of our home away from home. One of the lovely ladies in our pack of pals, Cara. Heidi and Eric. You may remember them from my last post. You’ve never met Carol Ann. She’s wearing a fabulous ’20s sweater dress and cardigan with matching chapeau. Unfortunately, I didn’t get many pictures of the rest of my chums, but we were quite the amoeba, merging, splitting up, and reforming as our varying interests took us in one direction or the next. After riding the carousel and spinning myself silly on the tea cups, we went over to California Adventure, which is just a few steps away from Disneyland, rode the trolley and settled down for a nice cocktail at Carthay Circle Restaurant as we waited for our dinner reservation. A nice, stiff gin and tonic for me (no carbs!) and a great dinner with friends made the day end perfectly. Miss Lily, who needs no introduction, having been featured here often. Well, it wouldn’t be perfect until I rode the Tower of Terror, my favorite ride, which I rarely get to ride as we normally have our son with us. Not the most attractive picture, but the eyes say it all. And thus ended our Disney day. What is your happiest place on earth? You look great in that Pendleton! We came across one of the Pendleton's with the Disneyland label in it (when the store was in Frontierland). It didn't fit anyone at our house, so it ended up the hands of a good friend! It's funny because I promised myself that I would NEVER go on Tower of Terror (I HATE falling/dropping) but it is now one of my favorite rides too! I was the same way. I would do the dropping rides at other parks and despise them. I think because it is short little drops, not a long free fall, that makes it not as freaky to me. What a find on the Disney Pendleton. Whoever got it is very fortunate. Excellent post!It was so nice to spend time with you guys and in the park.If we had more time to go there we would totally get passes.Dapper Day was awesome.good pictures. What a splendidly wonderful looking Disneyland outing. That Pendleton is so timelessly lovely and suits you to an absolute tee. Wishing you a fantastic St. Patrick's Day! Aw, such a wonderful day! !